14th Annual Celebrate Sinatra Party at The RITZ Ybor! Hey Tampa Bay, Alex here with some exciting entertainment news for all of you who love Frank Sinatra. 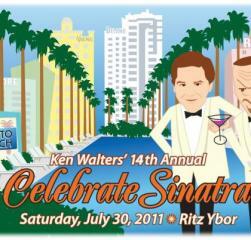 The 14th Annual Celebrate Sinatra, presented by Ken Walters, will be held on Saturday, July 30, 2011 at the historic Ritz Theater in Ybor City, 1503 East 7th Avenue. Celberate the life and music of Frank Sinatra at this year&apos;s event, which will begin at 8 p.m. and end at 1 a.m. This party will feature dancing to great American standards performed by Tom Tiratto, Lisa Casalino, Paul Phillips and the 17 piece big band Kym Purling Jazz Orchestra with special guest vibraphonist, Chris Rottmayer. These Latin Lovers will perform mambo, cha cha and other Latin favorites in the Copa Room. The price of admission is $50 and the attire is black tie optional. The event includes complimentary Finlandia signature martinis for the first hour, a cash bar, passed hors d&apos; oeuvres by Bernini, a cigar bar, valet parking and an After Party at the neighboring Don Vicente Historic Inn. Reserved tables and a VIP balcony are also available. For more information visit www.CelebrateSinatra.com. Have a wonderful day and check back often for more updates on fun Things To Do In Tampa Bay!